Our flagship model and a must for contractors who demand a brush cutter with high production rates, dependability and versatility. The HD 480B is a no-compromise design that delivers as promised. 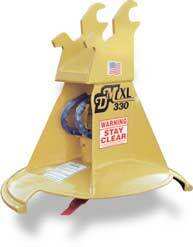 Identical to the HD 480B except in scale, the HD 420B brush cutter is a more appropriate fit for smaller carriers. HD 482 & HD 422 brush cutters have all the durability and efficiency of the above models, but without third boom extensions. An ideal match for long reach excavators. 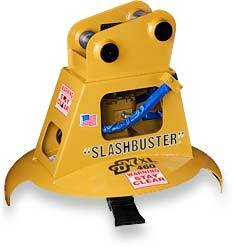 The world's only brush cutter with a hydraulically operated rotating debris shroud. Developed in response to safety concerns over ejected debris, the XL 480SB brush cutter features a 180-degree rotating shroud; giving you the ultimate in control. This development makes it possible to work near houses, roadways, utility poles, etc, with a much lower risk compared to any other brushcutter. 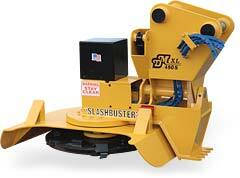 The XL 480S brush cutter is Identical to the XL 480 SB, but without a third boom extension. Cuts and mulches stems to 8" dia. The XL 480B is an XL 480 (below) with a third boom, serving up a price and performance that is hard to beat. 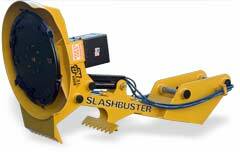 The XL 480 brush cutter features a more enclosed shroud design than our other models. 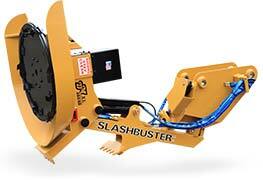 After numerous requests, we developed a brush cutter line that will fit excavators as small as 3,500 lbs. The response has been tremendous and for brush re growth applications they really excel. 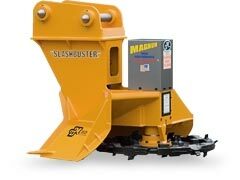 Bridging the gap between mid-sized and mini excavators, the XL460 brush cutter attaches to compact excavators in the 6-8 ton class and is capable of mulching brush and stems up to 3" in diameter. 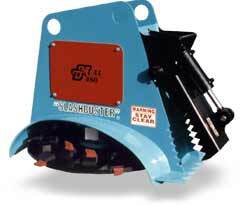 Purpose-built for its application, the XL 330 mini excavator brush cutter attachment excels in maintenance brushing. Small in size, it still shares the extra-durable triple-welded construction of our larger brush cutter models.